When planning your journey from Sarajevo to Dubrovnik there are several options to consider depending on your preferences and timings. The cheapest way to travel between these two cities is a bus which costs 148 HRK. The quickest way is to drive, which takes just under 4 hours if traffic is fine or to fly, via Zagreb. Typical bus route includes stopping in: Sarajevo – Hadžići – Konjic – Jablanica – Mostar – Čapljina – Metković – Opuzen – Neum – Ston /Doli / Peljesac crossroads – Slano – Trsteno – Dubrovnik. Typical bus route includes stopping in: Dubrovnik – Trsteno – Slano – Ston /Doli / Peljesac crossroads – Neum – Opuzen – Metković – Čapljina – Mostar – Jablanica – Konjic – Hadžići – Sarajevo. If you travel from Sarajevo, a seat on the right side of the bus will offer you great views of the coast, sea and islands. If you travel from Dubrovnik to Sarajevo, a seat on the left side of the bus will offer you great views of the coast, sea and islands. Driving from Sarajevo to Dubrovnik takes at least 4 hours (distance about 245 km). 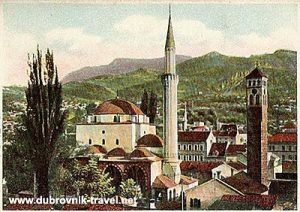 There are two driving routes which are either from Sarajevo via Foca, Gacko, Bileca and Trebinje to Dubrovnik by M20 and M18 roads or from Sarajevo via Hadžići, Konjic, Jablanica, Mostar and Metković to Dubrovnik by M6 and E73 & M17 routes.